I've tried many hot sauces but this is the best. This is great BBQ. We visited Wiley's BBQ in Savannah and just to have more. Great service, quick shipping, and some of the best BBQ I have ever had. I will be purchasing again in the future! Hands down the best BBQ sauce I have ever tasted. A friend recommended this. And I cannot live without my pulled BBq chicken and pork was amazing thanks to this BBQ sauce. You will not be disappointed. I first experienced this sauce in the restaurant in Savannah. It is the best BBQ sauce I've eaten - hands down. Extremely flavorful with a decent kiss of spice. I probably could survive the rest of my life with only this sauce (and maybe good, real sweet chili sauce) in my pantry. I always have at least a spare bottle on hand. Since I live in Pittsburgh, I buy it from here, and have been pleased with their services. Try the sauce - you won't regret it. We have loved this sauce since we ate at their restaurant in Savannah- hands down the best sauce we've ever had. Great flavor and texture, and just the right amount of spice! Has a little bit of Heat with a great taste. My family really enjoys this BBQ Sauce. I would like more heat to it. That of course is just my opinion. I am sure that if you try it you will like it. This is the best all around BBQ sauce i have ever had, we're addicted to it. We ate here twice when we were in Savannah. Loved their food & loved the BBQ sauce. Did want to buy the sauce when we were there, but did not want to carry it. All 8 of us ordered sauce together & there was no shipping & no tax. Great deal!! 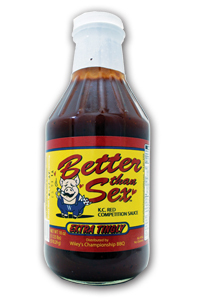 I'm not a "spicy, hot" lover of BBQ sauce but this one is terrific! We liked the original so much we wanted to try the extra tingley, however, this tasted sooooooo much like the original we thought it was mislabeled, just no real extra heat to this one. Stick with the original. That's what my blonde wife said with her bad spanish. She just says every thing with an "O" at the end. But it really is fantastic sauce.Everyone that has tried it, just loves it. Absolutely the best all around BBQ I have ever tasted. Great on pork, chicken and beef. Little sweet and heat. Great for competition and for the backyard. If you visit Savannah its the same sauce they have on the tables!